Heidi claims that a light bulb went on in her brain when she saw the connection between healthy eating and physical activity with academic improvement during the ECELC program. Heidi continued to learn more about best practices for physical activity and the associated learning benefits during the learning sessions and technical assistance visits. 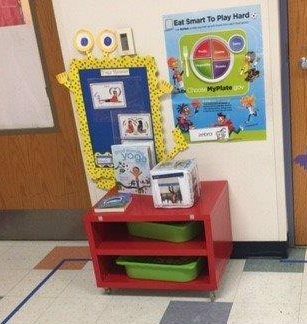 Heidi then began to collect physical activity equipment and materials in connection with the ECELC curriculum. The classroom now has an indoor learning center. These activities involve linking literacy and physical activity using books, activity cubes, geometric shapes, bean bags and much more. Although it’s a small space, it’s a big hit with the children because they have a range of activities to choose from. All the activities are aligned with the curriculum and the Florida Early Learning and Developmental Standards for Four-Year-Olds. Heidi recognized immediate benefits in her classroom such as increased attention spans, increased self-management skills, and independent learning. Heidi shared this information with her families and sent physical activity tips home with the children. Edith Gutierrez implemented several new changes at Gutierrez Family Child Care in Los Angeles, California. When her program started, her space was very crowded and not conducive for active play indoors. In 2016, Edith decided to participate in ECELC and learned about the importance of indoor and outdoor active play. She worked with her ECELC trainer to rearrange furniture in order to maximize her space for indoor play. A start-anytime, reusable calendar from Head Start Body Start which has fun, simple physical activities to do everyday with preschoolers. Each month, you’ll find fun ways to help preschoolers be active. The activities are perfect for children to do at home with their families too. You can send the calendars home in backpacks, post them on bulletin boards, or feature them in newsletters. You can also give parents and caregivers the calendars at pick-up time.